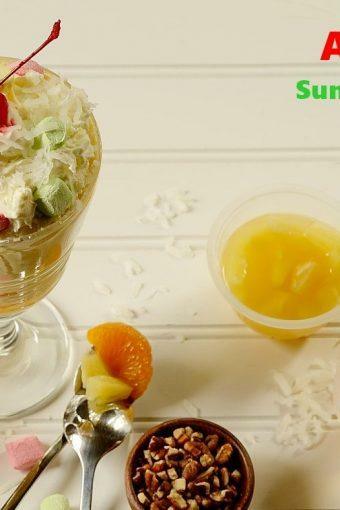 Ambrosia Sundae Milkshake is a fun, healthy, and satisfying drink that can be prepared quickly and served as an after-school snack or as anytime dessert drink. Disclosure: This is a compensated campaign in collaboration with DOLE and #WeAllGrow Latina Network. All the opinions are honest and 100% mine. Thank you, friends, for supporting the brands that I work with and love! Running out of ideas about what to prepare for an after-school snack? Well, we’ve got you covered! 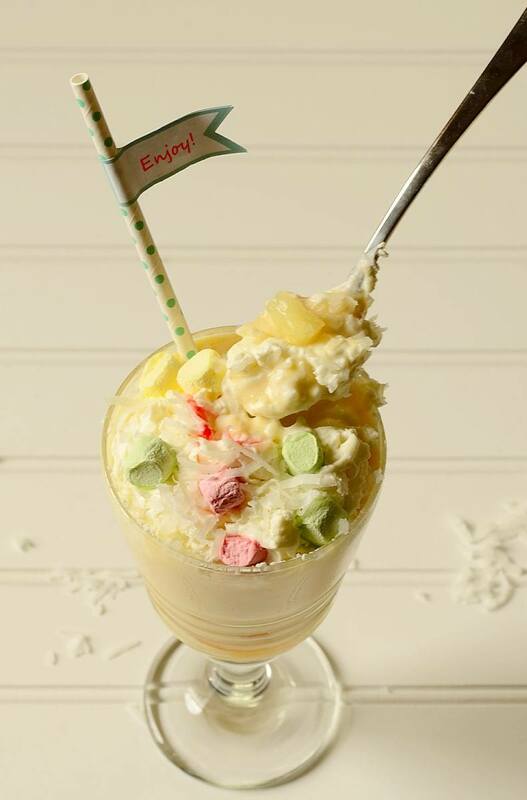 This Ambrosia Sundae Milkshake makes the happiest and most satisfying snack or dessert drink… for children and adults too. 😉 And you know what? 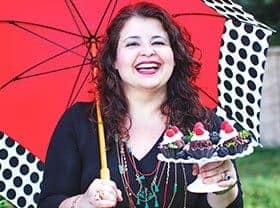 They can be whipped up in the blink of an eye and decorated all colorfully and fun for or by the kids. You should have just seen the big smile on my children’s face! 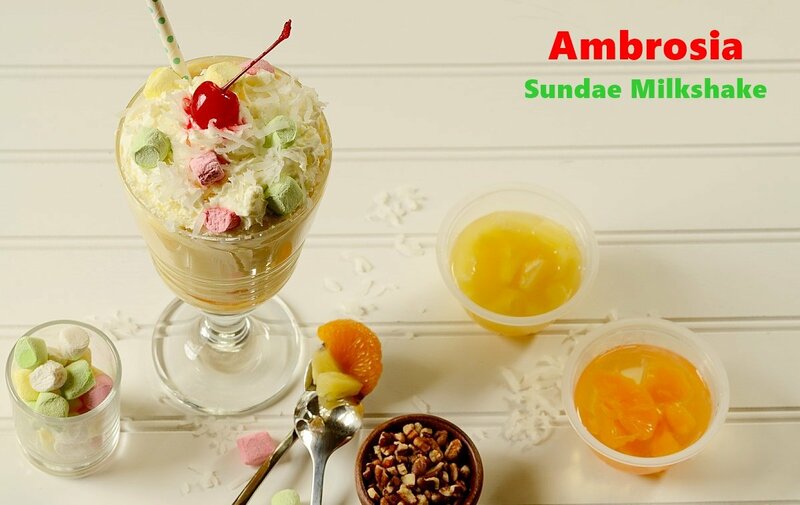 Our Ambrosia Sundae Milkshake requires simple ingredients: Dole Pineapple Tidbits, Dole Mandarin Oranges, sweetened coconut flakes, maple syrup or honey, low-fat milk, and low-fat frozen yogurt or vanilla ice cream. 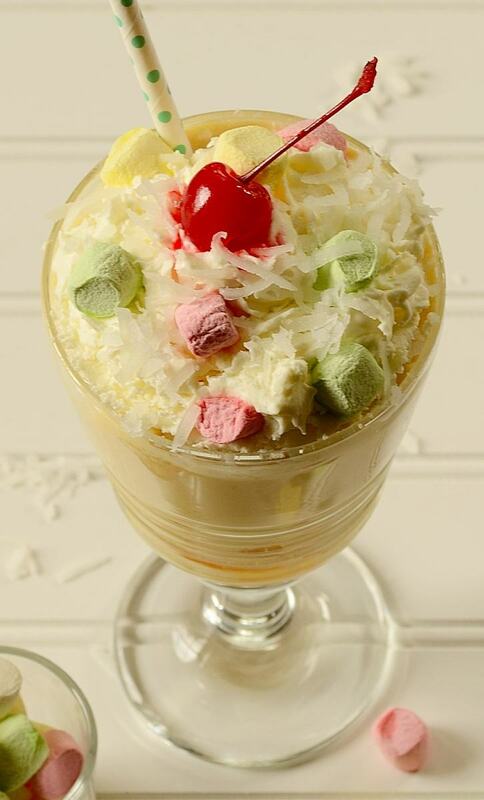 It can be garnished on top with light whipped cream, mini colorful marshmallows, and a maraschino cherry. Super fun, right? … and then top with whipped cream, mini marshmallows, and a cherry right on top. Voila! 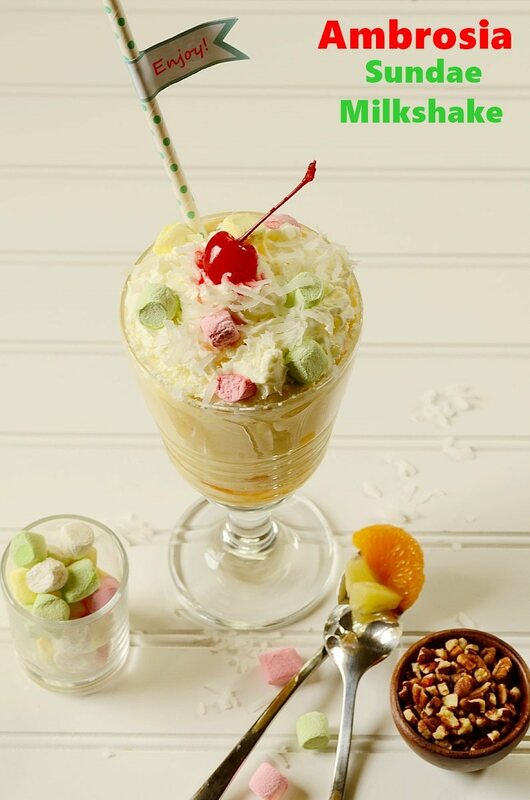 — the Ambrosia Sundae Milkshake — yes, based on the famous American ambrosia fruit salad — is ready to be enjoyed by happy eyes and hungry tummies. It is a creative drink based on an adored, timeless classic… yet still rich with fiber and other healthy components. As a big fan of tropical fruits such as pineapple and oranges, I enjoy the fact that I can have them all year round. Dole pineapple tidbits and mandarin oranges can easily be found in fruit bowls at your local supermarket, packing high-quality fruit in 100% real fruit juice, instead of the sugary syrup that other competitors use. Dole is a friendly, trustworthy company that’s been around for over 160 years… and the good thing is that it appreciates the importance of family heritage, and cares about their customers sharing family traditions and values — anytime of the day, feeding my children with healthy dishes and drinks is a must at my household! All that I can say is, invite Dole to your home and prepare to be surprised with everything they have to offer. I hope you have fun preparing this new fave of ours! 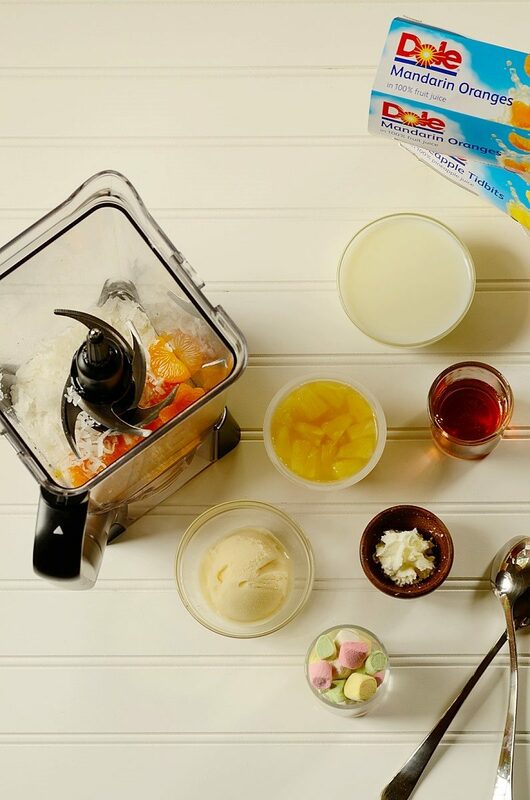 Blend the pineapple, mandarin oranges, coconut flakes, honey or maple syrup, milk, and ice cream or frozen yogurt in a blender until creamy and smooth. Pour into 2 tall milkshake-type glasses and then top each with whipped cream, 6 mini marshmallows, and a cherry. Drink immediately and enjoy! 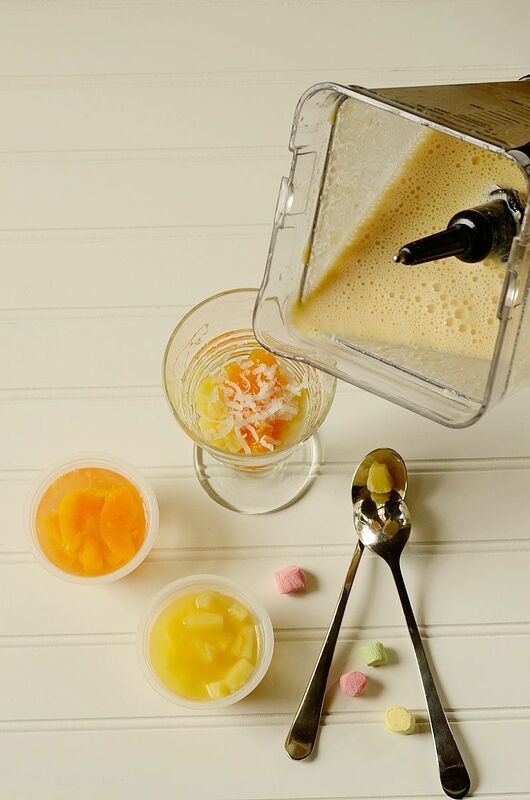 If desired, you can reserve 1/2 to 1 tablespoon of pineapple, mandarin oranges, and coconut flakes to place into each glass before pouring the milkshake into the glasses -- this way fruit can be eaten at the end as well. This looks great! SO flavor, and easy to put together. Perfect! 🙂 Thanks so much. Thank you, John! We did really enjoy this and the topping made my girls smile large. I just had dinner and I feel like reaching into the computer to have this for my dessert. Thanks for sharing this! Oh my can you give me two please! Love this dessert! My kids would love this! Especially the marshmallows!